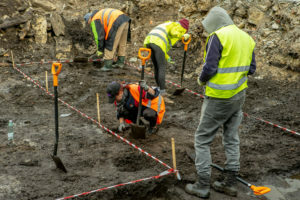 Capital Mill is developing the skyscraper Skyon in Maakri Street, Tallinn, and archaeological excavations are currently under way at the site. 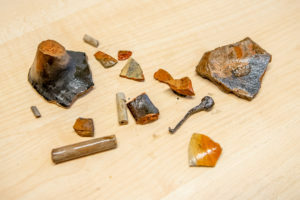 Over the past couple of weeks, rare coins, buckles and rings have been found, as well as a cannon ball and a unique piece of glazed stove tile. 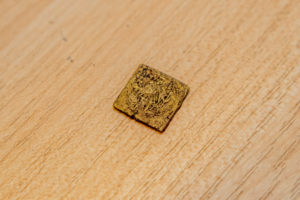 Skyon, to be erected at Maakri Street 30, will be located on the left bank of the former Härjapea River, and instead of the present city centre, there was a suburb three centuries ago. 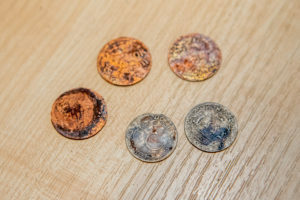 In the depth of one and a half metres, in the 17th-century cultural layer, a house foundation was discovered during the excavations, and inside and around it, several historically priceless objects have been found. 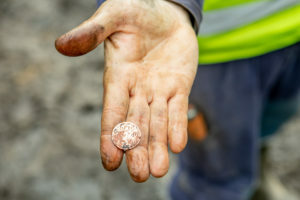 Rivo Bernotas, Manager of Arheox OÜ, which conducts the excavations, says that dozens of coins have been discovered, which may indicate that the people living in the house then used to hide their fortune, for example, under the oven, but a part of the small treasure was left behind for some reason. The building itself was either destroyed or demolished. 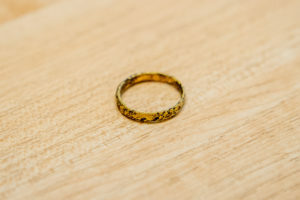 All findings will be cleaned, taken in for identification and stored in the University of Tallinn archaeology research collection, after which historians can synthesize and analyse data related to the findings. 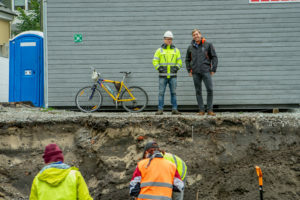 The excavations at the site of the future commercial and office building Skyon are conducted because it is a heritage conservation area, and preliminary studies carried out last year indicated that the soil is hiding a cultural layer dating back to the 17th century there. 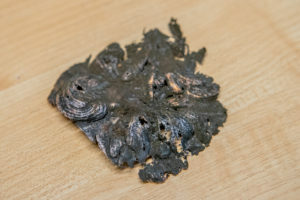 According to Capital Mill’s Construction Manager Silver Neemelo, the developer observes the excavations with great interest, as it becomes clearer every day what has stood in the past at the plot where the skyscraper will stand in the future. The height of the 26-storey Skyon, which will be erected at Maakri Str 30, will be 95 metres, making it one of the tallest buildings in the area. Skyon’s architecture follows the Scandinavian examples, combining the grandeur of the city centre with functionality and practicality. 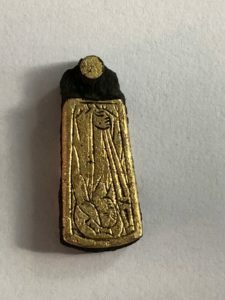 Photos of the excavations can be found at https://bit.ly/2DUvVPD. The author of the photos is Urmas Kamdron. Skyon’s special feature is its windows – with different shapes, sizes and layouts, which deliver a spectacular result while ensuring energy efficiency. LED light strips between the facade elements make the building stand out even in the dark. The eminent lobby of the office building is 11.5 meters high. The total rental space of the building is 8,200 m2. The total rental space of the largest, 2nd-4th floors is 1,813 m2 and these are more suited for larger companies. Starting from the 5th floor, the building is in the shape of a tower and the standard rental area of a floor starts from of 302 m2. Skyon will be built according to the high requirements of the LEED Gold certificate of environmental sustainability. Despite the fact that the size of the smallest offices starts from 34 square meters, such offices also offer everything necessary for comfort and functionality: a room for 4 workspaces and for meetings of 4 people, a toilet, and it will be possible to add a compact kitchenette with a sink and a refrigerator. The underground floors contain parking spaces, as well as rooms for bicycles, toilets and showers. Rough design pictures and photos of the presentation events can be found in Dropbox at https://bit.ly/2I31yrc. The presentation events’ author is Kalev Lilleorg, the rough design was created by KOKO Architects and 3D rendering by White Mammoth. The development project’s homepage is located at www.skyon.eu. Capital Mill OÜ was founded in early 2008 to help investors looking to acquire commercial real estate in the Baltic countries and generate value through high-quality property management services. The founders and partners of the company comprise a team with long-standing real estate and banking experience. The company’s investment portfolio consists of a large number of sought-after business properties in Estonia, Latvia and Lithuania.